At The Rios Law Firm we provide a free consultation that will give us an opportunity to analyze our client’s financial situation as well as analyze their loan in order for us to guide them in the best way possible. Our primary goal is to help our clients avoid the possible involuntary loss of their home. 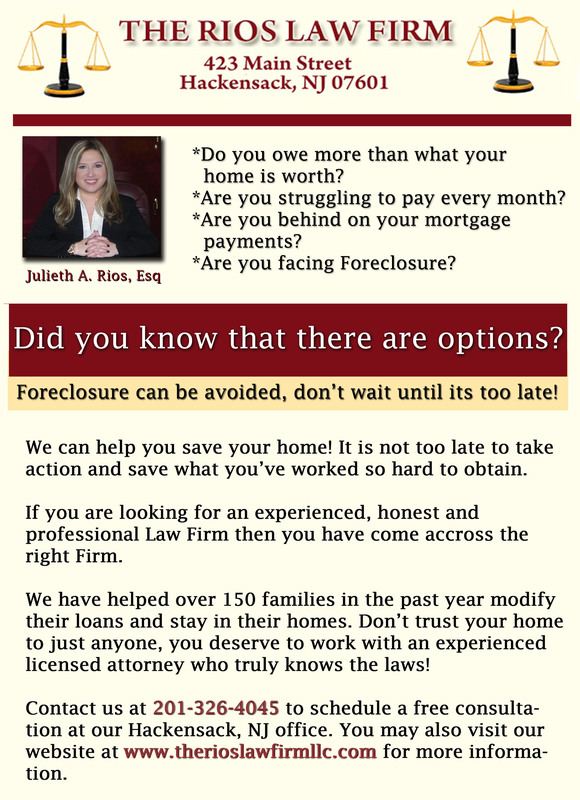 However, we realize that there are times when the only true recourse to avoid foreclosure is for the homeowner to either pursue a “Short Sale” or “Deed-in-Lieu of Foreclosure”. Our main concern is making sure that our clients are fully protected in every step of the process. En la oficina legal de la abogada Julieth Rios ofrecemos una consulta gratuita que nos da la oportunidad de analizar la situación financiera de nuestros clientes, así como analizar su préstamo para poder guiarlos en la mejor manera posible. casos, la unica manera de evitar foreclosure es que el cliente haga un “Short Sale” o un “Deed-in-Lieu of”. Nuestra meta principal es asegurarnos que nuestros clientes estén totalmente protegidos en cada paso del proceso.